Noble Academic Publisher publishes high-quality refereed empirical research on all aspects of Applied Economics and Finance. The Journal’s emphasis is on empirical, applied, and policy-oriented research in Finance and Economics. The Journal’s purpose is to improve communications between the academic and other research communities and policymakers and operational decision makers. Articles published in the journal are clearly relevant to applied Economics and Finance and identify both a compelling practical Financial issues and a strong theoretical framework for addressing it. 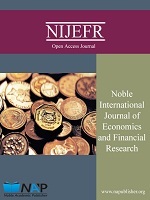 Noble International Journal of Economics and Financial Research (NIJEFR) is published monthly by Noble Academic Publisher. 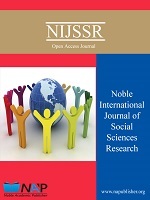 Noble International Journal of Social Sciences Research is a double-blind peer-reviewed journal freely available online. The aim of the NIJSSR is to publish articles that contribute significantly to the body of knowledge. It publishes both theoretical and empirical articles and case studies relating to sociology, political science, history, law in society and related disciplines. The NIJSSR may target scientists, researchers, professors, students and policy makers from sociology, political science, history, law in society and related domains. Published articles use scientific research methods, including statistical analysis, case studies, field research and historical analysis. 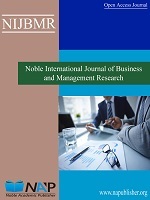 Noble International Journal of Business and Management Research (NIJBMR) is a peer-reviewed publicly available open-access journal. The primary purpose of the NIJBMR is to publish scholarly research articles in the fields of Management and Business. It appreciates original papers, systematic reviews and peer-reviewed research on all aspects of Management and Business. It is an open access Journal and all Processes i.e. Submission, Review Process and Acceptance are free. Noble International Journal of Scientific Research preserves prompt publication of manuscripts that meet the broad-spectrum criteria of scientific excellence. 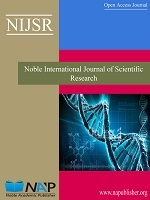 NIJSR is a peer-reviewed, international, and archival journal providing a publication medium for complete coverage addressing all topics of interest to academics, researchers, professionals, educators, programmers, practitioners, developers, managers and executives in the field of Scientific Research. The Journal is devoted to the publication of original Research paper, Review paper, and Short communication. NAP is one of the leading academic journal publisher. Noble Academic Publisher aims to identifying, exploring and nurturing intellectual human capital in the fields of Education & Business Management, Social Sciences & Humanities and inclined to attain a significant place in the world of academic research by its commendable activities. It is covering a wide range of academic disciplines. NAP serves the worldwide academic communities and contributes to the progress and application of social science and scientific knowledge by delivering scientific information and solution of research problems that permit advancement in scientific research.